Some of our readers reported having problems sharing files with other computers from their network. To help them, we decided to create this tutorial. We will show you how to make your Windows computer visible in your network and how to enable file sharing. All you have to do is to read carefully and follow these instructions. All the required configuration is done using the Network and Sharing Center. To find it, type the word 'network' in the Start Menu search box and click on the appropriate search result. Alternatively, go to Control Panel -> Network and Internet -> Network and Sharing Center. 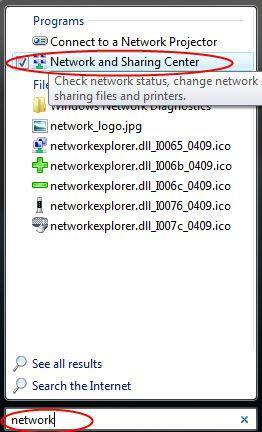 In Windows 10 you can just type "network and sharing center" in to the search field that opens when you click the little search icon in the bottom-left corner of your screen. First, you have to make your computer visible to other computers in your network. To do this, click on the Customize link appearing on the right side of your network connection. A wizard will start which allows you to customize network settings. 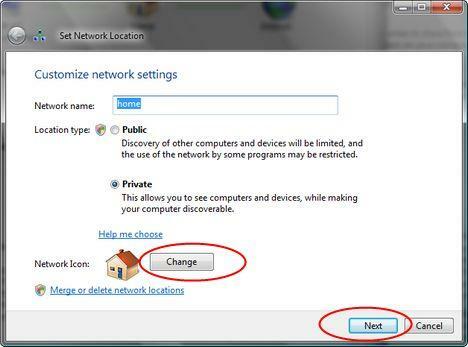 You can change your Network name, select the location type and change the network icon. To make your computer visible for other computers in your network select Private as the location type. When you are done click on Next. In the next wizard window click on Close. 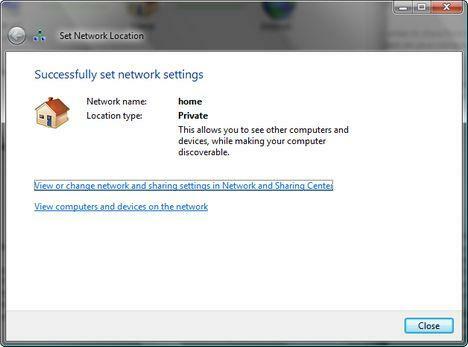 Now, that your computer has become visible in your network, you can configure different sharing options. 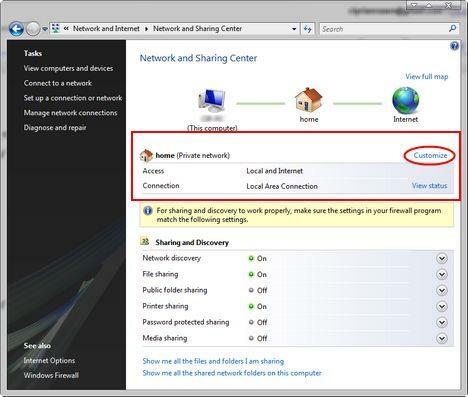 The first option in the Sharing and Discovery list of configuration settings is related to network discovery. You can turn it on and off, making your computer visible or invisible to other network devices. The next setting is about enabling or disabling file sharing. To enable it, select Turn on file sharing and click on Apply. The third configuration item allows you to turn on the so called 'Public' folder sharing. If you turn it on, Windows Vista will create a folder called 'Public' which will be shared with other people using the same computer or other computers from your network. Any file or folder that you will copy into the 'Public' folder will be automatically shared with everyone that has access to it. The next configuration option allows you to share your printer. Select Turn on printer sharing, click on Apply and your printer will be shared with the other computers from your network. The fifth configuration option allows you to protect all your shared files and printers by using a password. If you turn it on, only the people who have a user account and password on your computer will be able to access them. 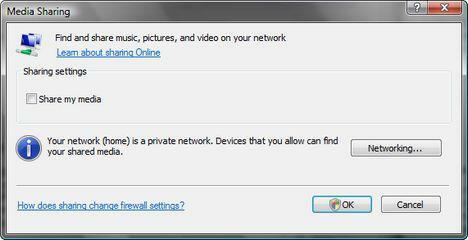 If you turn on Media sharing, you can share music, pictures and videos with other computers from your network. To turn it on, click on Change and, in the next window, select the option that says Share my media. Then, click on OK and you will start sharing your media. we are sharing between 3 computers in a peer-to-peer network between 3 Vista computers. We can get them to share between the "Public" folders, but when we try and set the sharing up on any of the other folders (we want to set up the "my documents" folder on the boss's computer as shared access for the office manager and myself ~ he doesn't have to have access to our computers...but we need acccess to his...so we won't have to be running in his office every little bit to access the files we need!) It keeps asking for user name and password, but none of the blasted things have user names and passwords set up! It's also a private workgroup, not a public. We even had an outside tech guy come in..he said all of our configurations are set up correctly and he couldn't figure out why it was doing it either! We are at the point where we are saying "to heck with it" and are going to put all the important stuff in the public folders unless someone can make a suggestion as to something else for us to try. Firewall has been turned off on individual computers, the firewall is on the T1 line, external to the inner workgroup, so I know it's not a firewall problem. Matching user accounts have been set up on all three computers, with same names, no passwords, all with administrator privledges, so I know it is not that. Can actually see the hard drives, see the folders, but when try to access them, cannot access them. From what I understand, all the 3 computers have no password setup for logging in. If I remember correctly, there might be a policy in Windows Vista that prevents you to connect to personal shared folders (such as "My Documents") without a password. The fastest solution would be for you to create a password on all 3 computers & user accounts. To make things easy, you can setup the same password for all computers, even though it would be best to have it different. Now, next time you connect to the Documents folder of the office manager, type the username he uses to login to his PC and his password. First, i bought an Hp vista home premium laptop. and an windows xp profeesional computer. My problem now is that my xp computer cant be visible in the network of my vista laptop. i tryed all the steps and i coudnt know the reason. all i want to knw is that why arent they visible and cant take folders from their. yes am using a router and both computers are connected to it. please send me an e-mail with solution if u can =D or add me on msn to help me . thx ! I know that UPnP is dependant on HTTP SSL, so go into services and make certain that is enabled. Additionally, look for the Notification service, right-click it, and choose Properties, and then open the Dependencies tab. Make sure all listed dependencies are running before trying to start it again. I have a Windows 2008 domain with 1 Windows XP SP3 and 1 XP SP2 workstation. The client computers are seen and communicate without issue to the server. However, the XP workstations are unable to communicate or even see each other. I know that on Windows Vista and 7 you can usually correct this by configuring Network Discovery. Is there something that can be done in Windows XP to resolve this issue? I had the same problem in Vista where I could not turn on file share. This occured after uninstalling Norton IS. This is how I resolved it: 1st I temporarilty turned off windows firewall to see if it was the problem, and sure enough I was then able to turn on file share. I looked in exceptions in the FW settings, and noticed there was no entry for file sharing. I have followed all of the instructions that I have come across and am continuing to receive an error message stating that it 'could' be that the xbox not connected to my network, my setup key is incorrect(which it is not), and my firewall accepts UPnP discovery. To my knowledge all of that is correct. please what can i do to normalize this problem.